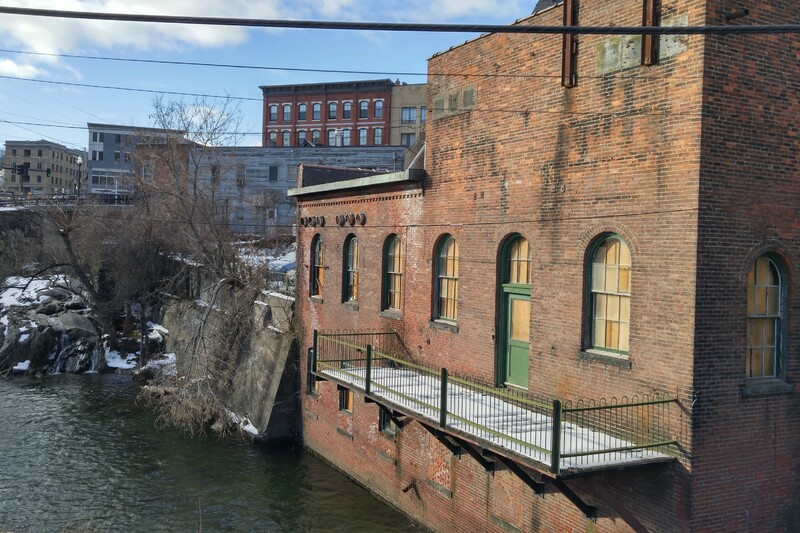 According to the Brattleboro Museum & Art Center, the disused industrial building at 11 Arch Street in downtown Brattleboro has been granted "a new lease on life" — BMAC purchased the property from Green Mountain Power on December 11. The approximately 4,500-square-foot brick building is more than 130 years old. "For most of its life it was used by various power companies," BMAC director Danny Lichtenfeld told Seven Days. Formerly, it was the generating station, substation and service center for Central Vermont Public Service Corporation, Twin State Gas & Electric and Brattleboro Gaslight Company. "Plans for the new facility have yet to be finalized," he added, "but may include artist housing or studios, gallery or event space, classrooms and a terrace overlooking the brook." To date, BMAC has spent more than $70,000 on structural and environmental assessments of the building, funded by grants from Windham Regional Commission, Vermont Housing & Conservation Board and Preservation Trust of Vermont, as well as by a gift from a private donor. "The next thing we need to do before we can do anything really great is to clean up some environmental contamination," said Lichtenfeld. BMAC has applied to the Environmental Protection Agency for the maximum $200,000 in grants of this type to put toward what is estimated to be a $240,000 clean-up job. The director anticipates a response from the EPA in April or May. The repurposing, and sometimes rescuing, of obsolete spaces by arts organizations is a relatively common occurrence in Vermont. BMAC found its present-day home 45 years ago in the town's Union Station, which was in a state of disrepair. Frog Hollow's first location was in Middlebury's abandoned mill, which was acquired by the craft center in the 1970s. In 2000, Barre's Studio Place Arts opened in the Nichols Block building, which had been slated for demolition. The Compass Music & Arts Center in Brandon occupies the 52,000-square-foot former "Building K" of the Brandon Training School, which was abandoned in 1993. CMAC began renovating it in 2012. More recent interventions — or attempted interventions — include the New Moran plan envisioned by recent University of Vermont alums Tad Cooke and Erick Crockenberg. At the most ephemeral end of the spectrum is Overnight Projects, the initiative responsible for last summer's show "An Order," which took place inside Burlington's former orphanage.